The totally transformed 3,006-passenger Carnival Sunshine â€“ the largest Carnival Cruise Lines ship ever to be homeported in New Orleans â€” will sail this afternoon on its inaugural voyage from the Big Easy, embarking on a six-day cruise to Cozumel and Grand Cayman. Earlier this year, Carnival Sunshine underwent a $155 million, 75-day makeover that added a variety of innovations that are part of Carnivalâ€™s groundbreaking Fun Ship 2.0 enhancement initiative, along with several features unique to this vessel and 182 new staterooms. Todayâ€™s voyage kicks off a winter schedule of Caribbean departures from New Orleans that will further bolster the lineâ€™s position as the portâ€™s number one cruise operator, carrying 330,000 guests annually on two year-round ships. 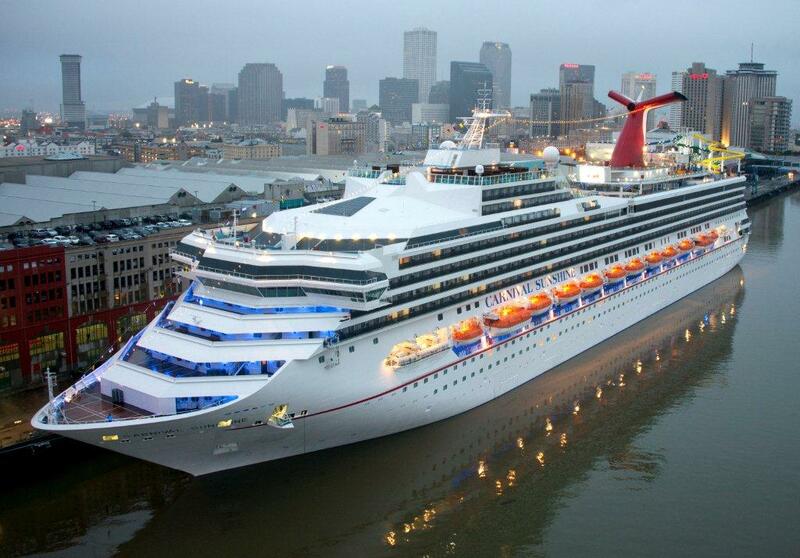 According to a study commissioned by the Cruise Lines International Association, Carnival and other cruise lines operating in the state of Louisiana account for $399 million in direct spending, generating 7,548 jobs and $294 million in income for the stateâ€™s workers. Carnival Sunshine will provide consumers sailing from New Orleans with an unprecedented array of on-board features, including a stunning three-level Serenity adults-only retreat, an outdoor recreation area with a ropes course offering breathtaking views to the sea 150 feet below, and a massive water park highlighted by a 334-foot-long corkscrew water slide that is the longest in the Carnival fleet. Dining choices include the Fahrenheit 555 steakhouse, a new full-service Asian restaurant called Ji Ji Asian Kitchen, the BlueIguana Cantina Mexican-themed eatery, and Guyâ€™s Burger Joint, developed in tandem with Food Network personality Guy Fieri. Exciting new bar concepts were also added such as the cocktail pharmacy-themed Alchemy Bar, the EA Sports Bar, the largest RedFrog Pub in the fleet, Latin-infused Havana Bar, and two new poolside watering holes, RedFrog Rum Bar and BlueIguana Tequila Bar. * One-hundred-and-eighty-two cabins, including 95 new spa staterooms located adjacent to the totally renovated Cloud 9 Spa, were incorporated, as well. Carnival Sunshine was officially named yesterday by godmother Lin Arison, a noted philanthropist and author, and wife of the late Ted Arison, founder of Carnival Cruise Lines. The invitation-only ceremony was attended by hundreds of travel agents, as well as local dignitaries and VIPs. During the ceremony, Carnival made a donation of $25,000 each to YoungArts and the New World Symphony, both of which are organizations founded by Ted and Lin Arison and dedicated to supporting young artists. Following todayâ€™s six-day voyage, the ship will operate a series of seven-day cruises to popular Caribbean destinations through April. Three different week-long itineraries will be offered from New Orleans â€“ an exotic western Caribbean route featuring Belize; Mahogany Bay (Isla Roatan), and Cozumel; a Bahamas/Florida schedule to Key West, Freeport and Nassau; and western Caribbean departures to Montego Bay; Grand Cayman; and Cozumel. My daughter is on this cruise. I can't wait for her to get back and give me an update. She was on the ship within an hour or starting the boarding process. She went to Guys Burger first and only had good things to say about the burgers and fries. She was on the ship within an hour or starting the boarding process. Seems like Galveston and New Orleans are competing for "Quickest to the Fun" these days. I've heard and experienced some great boarding times at these ports. Looking at cruising on the Sunshine myself this coming summer. Can't wait to see what she looks like since I was on her (Carnival Destiny) in 2009. Fill us in with the details when she gets back! We want to hear it all!!! My wife and I will be ging on the Sunshine in December and we want to know what's what!!! Carnival Sunshine where is it?